Last Monday Esquire revealed that they would once again be pushing the boundaries of print. As I'm sure everyone will remember, Esquire's first foray into enhanced print was with their ePaper 75th Anniversary issue, and following that they did their brilliant split cover. This time, however, it's Augmented Reality that is their enhancement of choice. 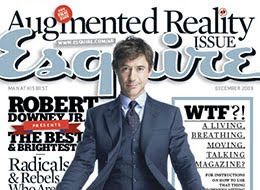 For their December issue Esquire have developed an Augmented Reality cover featuring none other then Robert Downey Jr.. Downey introduces the issue and does a brief plug for the upcoming Sherlock Holmes movie. The real fun comes in with a host of bonus content that is accessed and controlled on the Esquire website by installing an app and interacting with the Augmented Reality marker. In the following video, Editor-in-Chief, David Granger, runs through the features. An example given is for the issue’s fashion features, which, by tilting the magazine in different directions, allows you to adjust the the weather in the shots with the model's changing to suit the new conditions.